This agent is an excellent communicator, adapting as necessary for his audience. He also clearly works hard to get the best price for his clients. We couldn't be happier with his services and the results speak for themselves. A vendor was selling a 4 bedroom House and found David via OpenAgent to sell her property. Dave initially won our business with hard work and top rate research regarding our property and the market conditions in our area. He did the most to satisfy us that the price point he was recommending was the right one through additional analysis and information about local sales. He then assisted us to prepare the property to maximise the sale price and while things were initially slow, he continued to work hard to identify and attract buyers, all the while providing exceptional communication without straying into over-promising. He nurtured potential buyers and the end result was that we achieved above our expected sale price and could not be happier with the outcome. 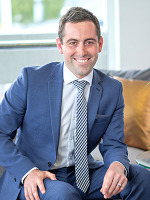 David McLeod has sold 99 properties in the last year. They’ve recently sold properties in Rose Bay, Lindisfarne, Acton Park, New Town, Howrah, Margate, North Hobart, Kingston, Oakdowns, Lenah Valley, Sandford, South Hobart, Risdon Vale, Austins Ferry, Glenlusk, Blackmans Bay, Rosetta, Granton, Bellerive, Derwent Park, Rokeby, Midway Point, Glenorchy, Honeywood, Mount Rumney, Sandy Bay, Geilston Bay, Orford, Old Beach, Mornington, Lauderdale, Bridgewater, Dodges Ferry, Claremont, Clifton Beach, Rosny, Penna, Bagdad. A recent sale was a 4 bedroom house at 2/1A Lenna Street, Rose Bay. Their highest sale in the last 12 months was a 4 bedroom house in Rose Bay for $1,300,000. David McLeodwill get back to you shortly. What can David McLeod help you with? Looking for more agents in lindisfarne?